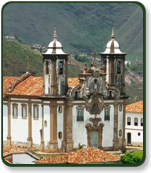 The 16th International Conference on Perception and Action (ICPA XVI) will be held July 6 - 10, 2011 in Ouro Preto, Minas Gerais, Brazil, at Estalagem das Minas Gerais Hotel. Participants should plan to arrive July 6 and depart July 11. ICPA is the conference of the International Society for Ecological Psychology (ISEP), which happens twice a year. Since the first meeting at Storrs in Connecticut, USA in 1981, ICPA has provided forums for researchers and scientists interested in how environmental information constrains action. This issue was prominently examined by the psychologist James J. Gibson, whose ideas led the development of the ecological approach to perception and action. We have been working hard preparing materials with information to assist you with your conference and travel arrangements. Note that two new information on the links ( ) were added to our website: Program - poster program and Transportation - schedule. Please, read all the information carefully and do let us know if you have any questions or concerns. We want to make sure you have the least amount of hassle possible preparing for your trip!